Mrs. 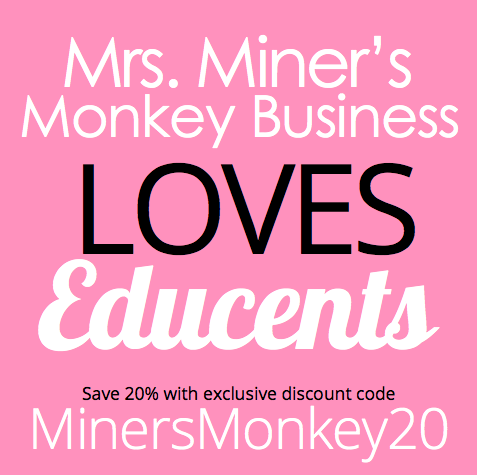 Miner's Kindergarten Monkey Business: Swing on in for a chance to get $25 to Educents! Swing on in for a chance to get $25 to Educents! Some of my Freebielicious friends and I wanted to share with you one of our favorite resources for teacher materials... Educents! They are an amazing small business taking over the educational field like a storm offering learning materials and curriculum at amazingly low prices! That's right.. you could win $25 from each Freebielicious totaling $450 for Freebielicious readers! Keep reading to enter and for more details! And have you heard about Edubucks? With Educents no good deed goes unnoticed. So as you purchase items for your learners, you will earn Edubucks for future purchases. You can also earn them through referrals so be sure to sign up and share with your friends! It's a great way to earn free materials for your students! 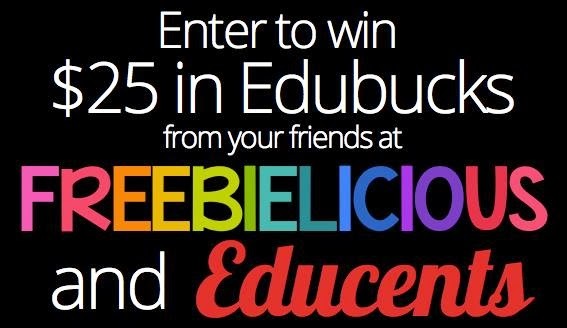 Educents has also given me and each of my Freebielicious friends $25 in Edubucks to giveaway to one of our readers! That's $450 in Edubucks to Freebielicious readers! Can you believe it? So enter below for my $25 giveaway and then visit my friends to enter theirs! And here's my other Freebielicious friends also hosting giveaways! Be sure to enter! Man, I hope I win! What a great give away! I hope I win. I never win any thing. I've been a fan of your blog for a few years. Gosh, I've been following you for at least 2 years....love your stuff but don't remember where I heard about your site from. I've been following you for almost 2 years I think! I have been a follower for at least 2 years! I LOVE your pokey pin activities! I have followed you and bought your products for a little over a year. Love your work and ideas. I've been following you for over a year and found you through The Kindergarten Klub (I think!). I have been following you for about a year now. I learned about you through simply kinder. I love your products and reading your blog. Your blog and Educents rock! Thanks! 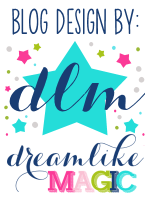 I haven't yet followed your blog, but I just signed up to follow your blog today! However, I have been to your blog before now, and I have also been to your TPT store!! Thanks for your great resources! You were one of the first blogs I started to follow when I was moved to kindergarten in October of 2012. My kinders have loved many of the activities I've found through your blogs. Thank you! I follow everything you have. You are a fabulous resource!